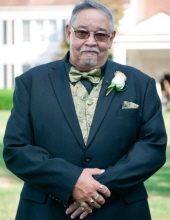 Mr. Thurman Lee Hawkes affectionately known as “RIP Hawkes”, “Pony”, and “T.L.”, 67 of 15105 McKissicks Road, McKenney, VA entered eternal rest and peace on December 4, 2018 at his residence. He was born on June 27, 1951 to the late James Abraham and Cleopatra (Tabon) Hawkes. After graduating from Southside High School in 1969, he worked a brief period at Velvet Textiles in Blackstone, VA before being drafted into the U.S. Army. Upon completing his time in the U.S. Army, he remained enlisted as a U.S. reservist before accepting a career at Phillip Morris, USA as a machine operator on February 5, 1973, where he worked diligently and faithfully for 32 years before retiring. He confessed Christ at an early age a became a member of Shiloh Baptist Church-Dinwiddie. Thurman loved playing cards with his U.S. Reservist buddies-Thad A. Jones, Amos Wingfield, Raymond Hawkes and Nathaniel Miller. After retiring he enjoyed gardening, relaxing in his garage of which he called “his office”, playing Yardzee and Solitaire. He was a faithful and active member of the McKenney Cruizers, of which he loved to showcase his antique car and trucks. Thurman was predeceased by a sister, Barbara A. Covington; mother-in-law and father-in-law, Joseph and Rosa (Rogers) Richardson; aunts, Dora Wilson, Erma Street Jordan, Willie Spicely, Lena Mae Tabon and Rosa Mae Hawkes; uncles, Hermaise Tabon, Frank Tabon, Thomas Tabon and Richard Hawkes. He leaves to cherish his precious memories: his loving and devoted wife of 38 years, Jackie Richardson Hawkes whom he joined in holy matrimony on December 22, 1979; a doting, loving and devoted daughter, Jacquetta L. Hawkes of Fairfax, VA; a brother, James B. Hawkes (Doris) of Newport News, VA; sisters, Elva Johnson of Dinwiddie, VA and Frances C. Burrow of Stony Creek, VA; one aunt, Annie Mae Tabon; two great nephews, Kaleb and Karter Joe Smith (whom he adored as if they were his grandkids); sister-in-law, Victory L. Robinson of McKenney, VA and brother-in-law, Algie L. Richardson of McKenney, VA; a host of nieces, nephews, devoted cousins-Ernest Hawkes, Mactoy Hawkes, Clinton Hawkes, Thomas Jordan, Sylvia Johnson, Iola White, Kelvin Jordan, Patricia Greenhill and several others too numerous to name; and good friends-Wyonna and Waverly, Billy Rhodes, Leeman Allen, Orlando Washington and Patricia and Thad Jones. He was a great man, loving spirit, generous heart and will be sorely missed. Funeral Services Saturday, December 8, 2018 at 1:00 p.m. at Shiloh Baptist Church-Dinwiddie. Interment church cemetery. To plant a tree in memory of Thurman Lee Hawkes, please visit our Tribute Store. "Email Address" would like to share the life celebration of Thurman Lee Hawkes. Click on the "link" to go to share a favorite memory or leave a condolence message for the family.